I found Canadian alt-rock band Matthew Good Band around age 20, the year their album "Beautiful Midnight" was going to make it's U.S. debut (in horrifically altered form - I have only ever owned the Canadian version). They have been a seminal presence in my life ever sine. Three of their four albums prior to breaking up still regularly haunt my iphone's playlist. I still bang out covers of some of their songs when I'm tooling around on my guitar. I still want to be them. But then they broke up, and Matthew Good embarked on a solo career that has now lasted far longer than the band's own brief 6 years. This morning, meaning to take out his second solo album, I accidentally put his 5th solo album ("Lights of Endangered Species") into my computer (yes, a CD in a CD drive) and proceeded to listen to it on my studio speakers. This was probably the first time I'd listened to it on them. I'm glad I did. It's lead me to reconsider it's value in the pantheon of his and the group's albums. While "Beautiful Midnight" was my introduction, it wouldn't take me long to go back and listen to the prior two albums. Matthew Good Band's debut was "Last of the Ghetto Astronauts" which has a couple amazing songs, but overall sounds like an indie band of the mid-nineties and struggles to firmly remove itself from the 80s and early 90s rock. To put it frankly, it's just not a cohesive sonic vision of an album and doesn't scream "professional". Their next full release was "Underdogs" which may have the best opening track of just about any album of the era. For a sophomore release, this is one of the best albums I own, and captures all his anger, the bands intensity, and the fierce melodicism of his singing and the underlying music. It's early, but it is fully formed and one of their best albums. This was followed up by (the Canadian version only please) "Beautiful Midnight" - the culmination of late 90's Canadian Alt-rock (think Our Lady Peace and Finger Eleven as other contemporaries). It still had some of the instrumental sparseness of mid-nineties rock but there was also some amazing production around the jagged guitars and fierce singing. This was the height of Matthew Good Band. An album that stood on it's own as individual songs and as a collected work. It embodied all of the sonic features of the band as well as Matthew Good's lyrics and unique singing style - targeted yet interestingly phrased timing, amazing pitch but incredible vulnerability, wrapped in anger and sadness and depression and lyrics you might not want to really understand because they were clearly insight into a man who was grappling with dark places. "Beautiful Midnight" was the culmination of "phase 1" of their sound. What feels to me like the next phase in their sonic evolution was their fourth album, "The Audio of Being" which retained the lyricism, melody, and intensity of the former two records, but began to add in some lushness, some slowness, some ambiance and clearly did so to create something almost akin to a album-length single work than a collection of songs. This was an album that was meant to be listened to as an album, in order, in one sitting, and worked best that way. It was a solid release, and despite some great songs, was probably just a tier below their prior two. It would be their last. After breaking up, Matthew Good began was has now been a 17 year-or-so solo career. But the second phase of their sound wouldn't end with "The Audio of Being." To the contrary, his first solo release, "Avalanche" was the apotheosis of this next phase. Gone was the need to fill an album mostly with high energy rockers baked in naked aggression and he now fully embraced the inter-connectedness and sonic ambiance of "The Audio of Being." Where "Audio of Being" was straddling two worlds, the new Matthew Good sound was here with "Avalanche." It was a breath-taking album, incredibly well recorded, with great songs, and a album-length consistency and vision. He wasn't afraid to take long long minutes with minimal music or singing, of slowing things down, of bringing in the timpani, or orchestrating a haunting vision rather than leading a stadium in hit after hit. Phase 2 was here, and it was brilliant. But then came "White Light Rock & Roll Review," his second solo album. While it had one or two "good" (?) songs, it was a blow to my expectations. After four consecutive incredible albums, this was a clunker. It was stripped down, but not in the mid-nineties couple of guitars way, it was hollow. The production was not memorable, the songs were missing their vibrant insight into his mind, the melodies not interesting, and the music empty. One should have seen this coming. For all it's incredibleness (and it is), "Avalanche" couldn't quite shake the feeling of being a bit empty itself. While it is a masterpiece, it sounds like one man. The Matthew Good Band albums all have the collected hearts of the members surrounding each passage, but on "Avalanche" every musical line, every instrument, basically points you back to his voice. He is front and center and really quite alone on that album - the musical lines and styles, even though played by others, have a uniformity. But the songs, the singing, the production on "Avalanche" were amazing and being the first solo album, one was amazed that his genius was continuing, so the singular focus wasn't distracting. But on "White Light..." the loss of heart hurt. It was just a forgettable album that also seemed a direct assault on the phase 2 sound of the prior albums. It was intentionally pushing away from that densely produced but sonically spare vision, but not into anything interesting or emotionally potent with its attempts at raw intensity. That album was followed by "Hospital Music," a mostly acoustic album of forgettable songs and then "Vancouver," which was so middling (not necessarily bad), that there is not much to say. *update 3pm 3/30/19 - I do want to spend a moment more on "Hospital Music" though. It was written following Matthew Good's psychiatric hospitalization and subsequent diagnosis of bipolar disorder. So while it may not resonate with me, I don't want to disparage something that probably has great personal significance to him. The challenge of being a consumer and critic is that to subjectively document how art impacts me I risk offending or hurting the creator. That is not my intent at all. My opinions cannot and should not ever be equated with an objective view of the art, nor a commentary on the personal value it has to its creator. I want to be sensitive that although I did not resonate with "Hospital Music" (despite being a life-long sufferer of extreme mental health challenges), that doesn't mean others won't or that it doesn't have value. Also, if you are suffering from mental health challenges, please reach out for help. At the very least, here is the national suicide hotline: 1-800-273-8255. It turns out "phase 2" would be a brief two albums, and "White Light" would presage a phase 3 that would include "Hospital Music" and "Vancouver." Phase 3 could best be summed up as "really well recorded local music performed by an incredible singer and band." Imagine that local band that's been trying to make it for 20 years, that just can't get their big break, hires a major national act to cover their songs and pays the best producers to produce the album. That's what phase 3 is: mediocre, forgettable, but not bad, songs played and recorded really well. It is the smoggy twilight that hides the colorful sunset to a brilliant, maybe too bright to be sustainable, early career. And then comes "Lights of Endangered Species," an album so late in the journey that I had probably only listened to it a couple times. But I remember liking parts of it. Yet somehow, it never really stuck with me and ultimately, after that first few weeks of listening when it came out, just got put away and forgotten. Until I mistakenly put it in this morning instead of "White Light..." What I got, was a reminder, that although far from perfect, far from a repeat of the albums that defined my early twenties, this was a talented singer, songwriter, and a well produced album that works as a whole album - if not necessarily as individual songs. I'm not sure I ever listened to it on my studio's speakers, but this is a really well recorded album. I believe it is produced by the same producer as "Avalanche" and certainly sonically it bears many hallmarks - the kick drum's sound is clear but authentic, the snare real and so much more than just a sample, there is texture and depth to the recording. But this is also, and maybe that's why I get it now, an album not for teens or early-twenty-year-olds, but for middle aged folk, which I now firmly am. Maybe it aged better because I've aged. It isn't memorable, save for maybe the last song, but has moments of the melodicism of the early releases. It has some of the expansiveness of phase 2, but it also has some of the local-band-ness of phase 3, especially with the heavy use of a brass section (BRASS SECTION IN MATTHEW GOOD!?!?!?!). Not perfect, but not an affront either. It might be the most fulfilling of the "phase 3" albums. It's interesting to consider what might have happened if this had been the follow-up to "Avalanche." Sonically, it is the most like it, and it has, in my opinion, better songs than the three in-between it and "Avalanche". What I'm most disappointed in myself about is that I haven't bought the albums that come after this to see what they might offer. Are they more of this? Are they a new phase? Do they rise above the low-point or do they continue it, making "Lights of Endangered Species" a brief respite from an otherwise forgettable string of albums? 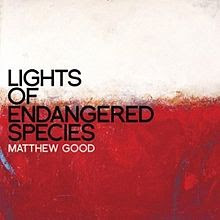 Certainly, "Lights of Endangered Species" if considered as the quiet, thoughtful album, as counterpart to the brooding of "Avalanche" and the blistering of "Underdogs" and "Beautiful Midnight" has a strong place in their history. I'm glad I re-listened, and I might again. But it also has inspired me to check out the more recent albums to see what they might offer and how they might relate. I'm also going to go back and give "Hospital Music" and "Vancouver" another listen to see what I might have missed, what I might not have been ready for. I'll keep you posted. ps. you'll find several of his albums in my favorite albums list here.